Evaluating the performance of dynamic multi-flow systems with the help of stochastic block diagrams. 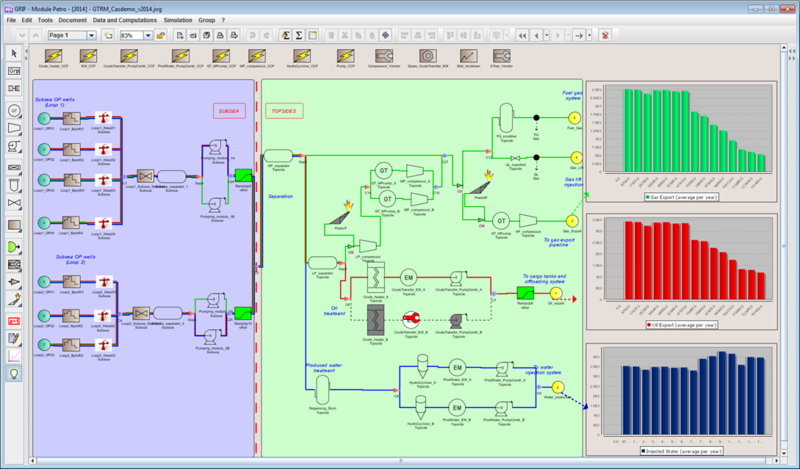 This module of the GRIF-Workshop software platform is used to model and simulate flow processing systems in a number of domains (oil & gas, distribution, etc.) in order to calculate their production availability. This decision-making tool helps to optimize design by comparing the production availabilities of different possible architectures, to identify the weak points and check that the targets defined for the system are met. Users can easily create block diagrams via an intuitive graphical interface. There is a large choice of equipment (pumps, compressors, filters, separators, tanks, wells, flares, etc.). The equipment behavior is highly configurable and the user can modify a number of parameters including failure rate, repair time, start-up time, capacity, start-up conditions, downgraded failures, teething problems and common cause failures. Temporal, mean or periodic production for each flow and each of the system outlets. The contribution of each piece of equipment to the system production losses. Mean or periodic availability of the installation for each flow. Sequences or Cut-sets that lead to a specific event. As well as allowing you to model your system, the Petro module also helps you manage the associated logistics and operating environment. 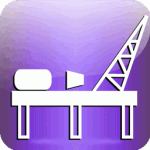 A Gantt diagram can be used to define preventive maintenance operations. For each instance of equipment failure, the repair team and the stock of spare parts that must be used can be specified. Users can configure the time required for repair team mobilization and time slots for each team. Users can also indicate the number of spare parts and how the reserves will be restocked: either on request when a certain threshold is reached or periodically. For each piece of equipment, the Petro module generates Petri nets that correspond to the behaviours specified by the user. The great strength of stochastic Petri nets lies both in their modelling power and in their capacity to describe the dysfunctional (component failures) and functional (architecture and support functions such as maintenance or reconfiguration procedures) parts of an installation. Perform interactive simulations to enable observation of equipment behaviour and validate your model step by step. Present the contribution to losses in different ways: for all components, by failure type, by component type or by groups of components defined beforehand. Display the component configuration in a summary table.